Ever since I've been a kid, I've always been adventurous. My dad and I would always try to sneak me on the big kid roller coasters even though I was still slightly too short. When my travel buddy, Viktor, said the #1 thing he wanted to do in New Zealand is bungy jump, at first I brushed it off. I already went skydiving at over 10,000 feet with a 50-second free fall--bungy jumping should be nothing comparatively. 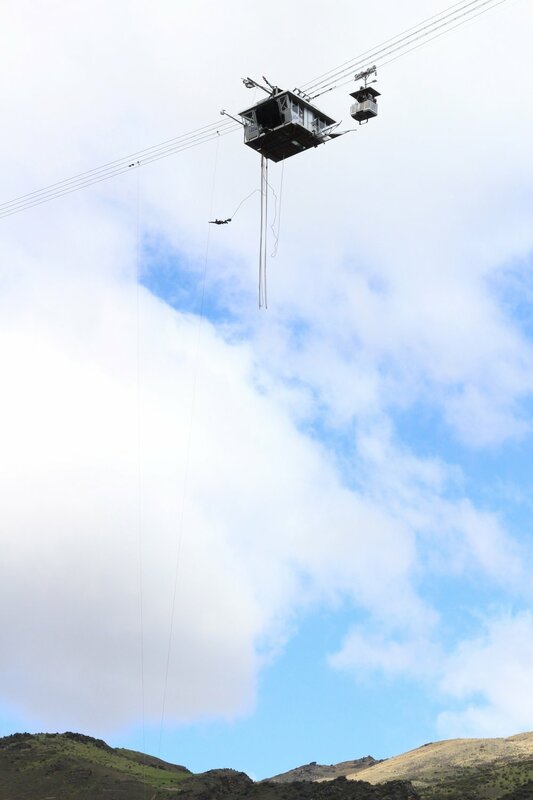 The Nevus Bungy is the largest bungy jump in New Zealand. It used to be the biggest in the world until a bigger one was built in Macau, China. Even so, at 134 meters (440 feet) with 8.5 seconds of free fall, I thought it still couldn't compare to skydiving. However, since a couple of my excursions in Fox Glacier and Franz Josef Glacier were cancelled, I had some money left over and decided to go for it. 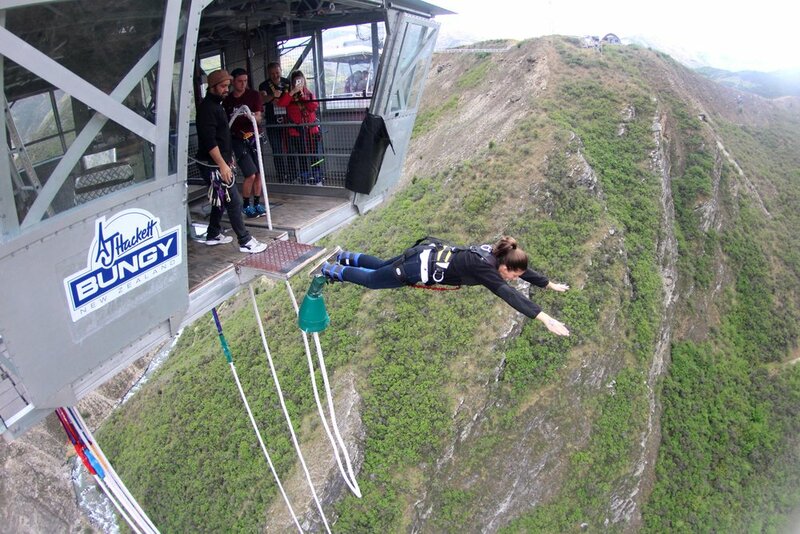 Queenstown is the home of the first commercial bungy jump in the world. If I was going to bungy anywhere, it should be there. After meeting at the bungy office in Queenstown, I was weighed and signed some "I won't sue you if I die" papers. We were driven about 40 minutes out to a canyon that, apparently, we were going to jump into. Yeah, that white thing on the top left? That's the gondola I jumped out of. The Nevus Bungy team was great. They paid a lot of attention to us, our harnesses, and our questions. Finally, we headed out to the canyon. 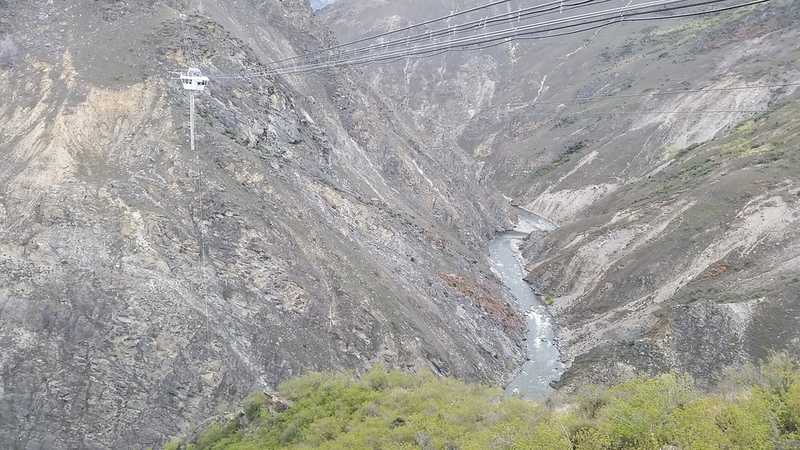 There was a cable wire connected to both sides of the canyon with a seemingly small gondola in the middle which hung about 350 meters above the river. While waiting for the mini gondola to bring us to the big, stationary gondola in the middle of the canyon, we got to watch a couple jumpers. They fell so much farther than I expected they would. From that angle, you could really see how much the bungy stretched once the jumper got toward the bottom. It was pretty scary to watch but I was excited! Viktor has been talking since the day I met him about how afraid he was and how big of a deal it was. Well, it was obvious as we looked over the canyon, that that feeling didn't go away. We took the little gondola to the stationary gondola in the middle of the canyon. It was a very small and open gondola. Only about four or five people fit in it and we could feel the wind sway us back and forth. Fun fact that we found out when arriving to the stationary gondola: IT HAD GLASS FLOORS!! That was something we were not expecting. When we got to the stationary gondola, there was loud pump up music playing. I'm guessing it was supposed to get us PUMPED UP to jump into a canyon! A woman that I met on the Milford Sound cruise, and knew was bungy jumping that same day, was all set up and being coaxed to jump by one of the workers. Apparently, the pump up music wasn't working for her because she must have been up there for 15 minutes.Her husband video recorded every second of the coaxing to make sure he didn't miss her bungy. He didn't. The gondola roared with applause as she jumped and when she was brought back up. She was so happy when she noticed we were behind her the whole time. I had to ask, "What did they tell you to get you to jump?" She smiled a quivering smile and said, "The guy finally asked me, 'Other than fear, what is preventing you from doing one of the coolest things you can do on this planet?'" It made sense to her then. After she thought about her kids and how proud they would be of her when she jumped, she bluntly replied, "Nothing," and jumped! We were all so proud of her! Viktor was next. I'm surprised he didn't piss his pants. He kept repeating how terrified he was. I told him that if he keeps talking it up to himself it'll only make it worse! To be honest, I think it was more fun for him to make himself as afraid as possible. Makes sense, I guess. Viktor jumped with his GoPro in hand and then it was my turn. Well, here it is in photos. Getting strapped up while Viktor is brought up. Disclaimer: Bungy jumping is more scary than (tandem) skydiving. It was amazing. It was truly an out-of-body experience. As they were setting me up in the chair, there was a big gust of wind that shook the gondola. They are very careful about high winds so I had to wait a few seconds before they gave me the OK. The guy took be by the back of my harness and basically walked me off the plank. When I got to the edge, they dropped my bungy cord which gave my ankles a small, yet terrifying, pull. It was time. 3 - 2 - 1 - BUNGY! I didn't jump. My body did. At least, that's how it felt. It was amazing. I free fell for a total of 8 seconds, which was plenty of time to comprehend what I just did. Unlike tandem skydiving, I did all of this myself. I shuffled my way to the edge of the gondola basically by myself, I looked down, and I had total control. With tandem skydiving, you really don't have a choice. You have very little control where with bungy jumping, I stared at the river 488 feet below me and just went for it. Yeah, I might have had a thought or two that jumping would result in whip lash or a broken bungy cord, but I'd have a pretty boring life if I don't scare and surprise myself sometimes. Bungy jumping 440 feet didn't leave me in pain like I thought it would. The only thing that was a bit uncomfortable, and totally wicked, was that it was hard to breathe for a bit mid-jump. It's weird because I don't remember that feeling when skydiving. I couldn't have had that much trouble breathing while skydiving, though, because I free fell for almost a full 60 seconds. Long story short, bungy jumping is incredible. It is a must-do when visiting Queenstown. See the full video below!